Can someone email me this in English?! I want the instructions. This is really simple, you’ll need: transfer paper or baking paper, a soft pencil, a bowl of water, washcloth, baby powder, makeup sponge, rubbing alcohol, cotton pads ,waterproof eyeliner and some lipstick sealer or special effecs makeup glue(optional). Start by choosing your design and print out the image. Next you put your baking paper or transfer paper on top of your image and start tracing. I’ts important to use a soft pencil when you trace your image. Next it’s time to prep your skin, put some rubbing alcohol on the area you want your fake tattoo. When you re finished fasten your transfer paper on the same area (penciled side down ofcourse). Wet your washcloth and start dabbing it on the transfer paper, we want it to get soaking wet to transfer the pencil lines from the paper to our skin. This can be tricky. Sometimes I spray my transfer paper with a little water before I place it on the skin it makes it stick a little better. Practice makes perfect. When the pencil lines have been successfully transferred on to your skin dab the skin with a dry cotton pad lightly. Now it’s time to start drawing with you waterproof eyeliner. Then allow to dry. Apply powder by dabbing lightly with your makeup sponge and finally you seal your tattoo with a light layer of lipstick sealer or the special effects makeup glue. If you decide not to use sealer I recommend you put another layer of eyeliner to sharpen your tattoo image. Does it come off after a certain amount of days or week? Don’t you read? The instructions are below. She SAID the instructions are in the comments in English. how long does this tattoo last? How long does this generally last? Approximately how Long will the fake tattoo last? Hey, that’s a great idea, we have to try this. We loove tattoos so it’s perfect to see which tatttoo comes next. Thanks a lot for this post!! Purell hand sanitizer works too, or anything you’d use to sterilise cuts and scrapes and minor injury’s ‘s – My local pharmacy they sells 35% propanol I usually use that or the hand sanitising gel. Whats a substitute for lipstick sealer and a soft pencil. 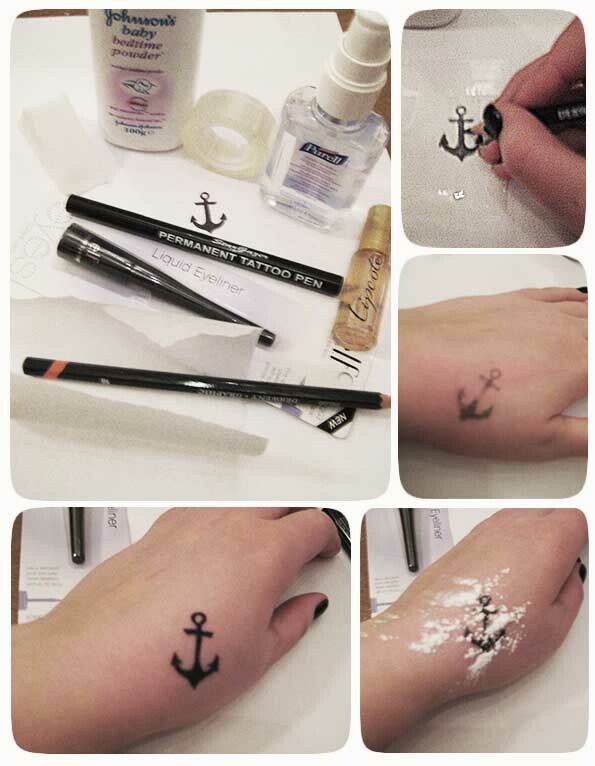 You don’t really need the lipstick sealer, but if you want the fake tattoo to last longer you can use clear special effects makeup glue or maybe clear nail polish if your skin can halide it (depends on where your tattoo is placed). And the pencil, well what the soft lead in the pencil does is that it’s like a stamp on the baking paper when you place it on your skin and damp it with a wet washcloth so you need something with a similar effect you cold try using a soft eyeliner to draw your tattoo design on the baking paper (or wax paper) or maybe some coal. Good Luck! What if the you don’t have those kinds of paper.. And don’t want to go out and buy any? Once apply the lipstick sealer does it leave it with a „wet look“? Does it dry up after a few minutes? And this glue, does it leave a shiny look?